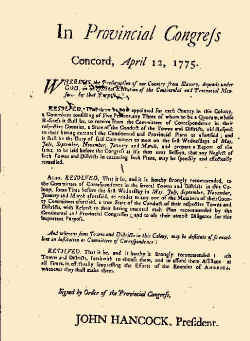 RESOLVED, That there be now appointed for each County in this Colony, a Committee consisting of Five Persons, any Three of whom to be a Quorum, whose Business it shall be, to receive from the Committees of Correspondence in their respective Counties, a State of the Conduct of the Towns and Districts, with Respect to their having executed the Continental and Provincial Plans as aforesaid ; and it shall be the Duty of said Committees to meet on the first Wednesdays of May, July, September, November, January and March, and prepare a Report of the same, to be laid before the Congress at it's then next Session, that any Neglect of such Towns and Districts in executing such Plans, may be speedily and effectually remedied. 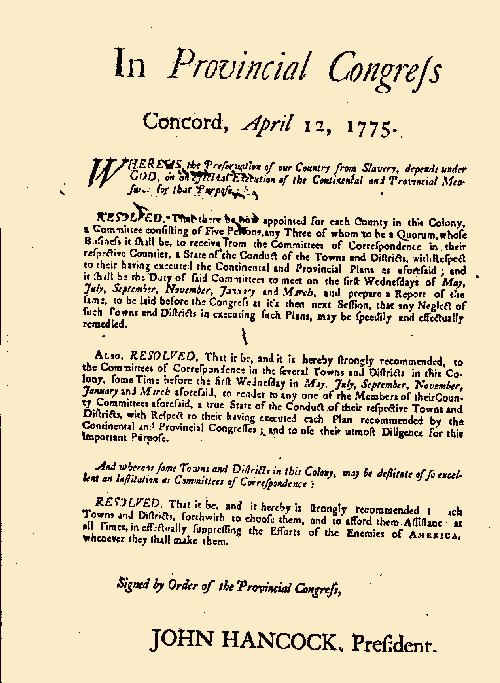 Also, RESOLVED, That it be, and it is hereby strongly recommended, to the Committees of Correspondence in the several Towns and Districts in this Colony, some Time before the first Wednesday in May, July, September, November, January and March aforesaid, to render to any one of the Members of their County Committees aforesaid, a true State of the Conduct of their respective Towns and Districts, with Respect to their having executed each Plan recommended by the Continental and Provincial Congresses ; and to use their utmost Diligence for this important Purpose. RESOLVED, That it be, and it hereby is strongly recommended to such Towns and Districts, forthwith to choose them, and to afford them Assistance at all Times, in effectually suppressing the Efforts of the Enemies of America, whenever they shall make them. Are the Committees of Safety an historical solution to a modern day problem? in favor of working together to restore constitutional Government. The Committee of Safety - Liberty Tree Forum is now open.